Let me tell you a story about Willie. So this is going back well over a quarter of a century, pretty near 30 years now, when your pal Mike was still but a comics retail neophyte, learning the ropes about slingin’ the funnybooks. We had a customer, Willie, who would come in his old van to the shop once or twice a month, popping in to ask if the latest issue of “the Rabbit” (AKA Usagi Yojimbo ) had come in. Another thing he would ask about is if we had any back issues of The Bug in stock. Took us a bit to figure out who and what he was talking about. 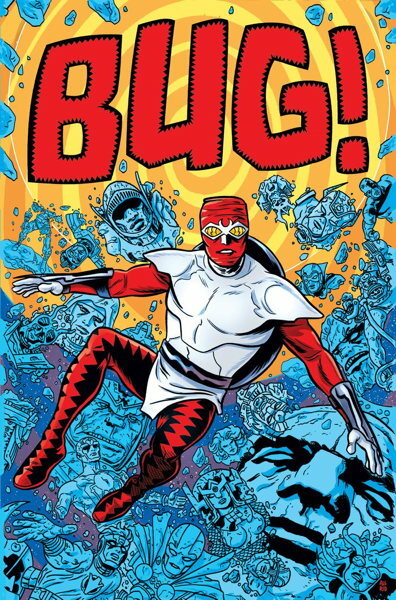 Turns out he was thinking of the character Forager, alternatively known as the Bug, who was a supporting character in Jack Kirby’s New Gods . “Willie,” we would say to him, “do you mean issues of New Gods in which the Bug appeared? 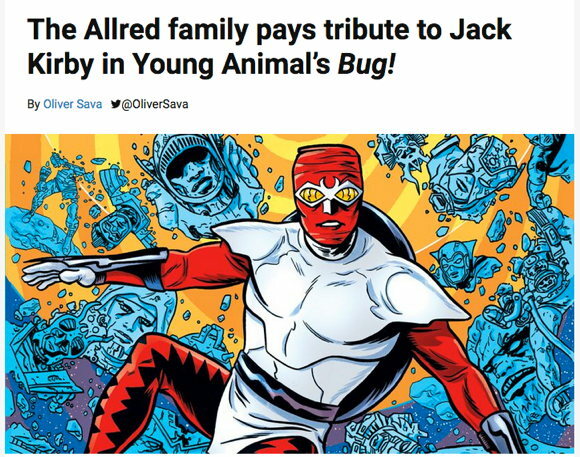 Is that what you mean?” And Willie would reply, nope, while that was the character he was definitely thinking of, he specifically remembered the Bug starring in his own solo comic book series, separate from New Gods . Now, we eventually convinced Willie that he was almost certainly misremembering the comic (in fact, I’d bet money he was thinking of this issue), but he would still bring it up once in a while, as a running joke. My then-coworker Rob and I even toyed with the idea of writing and drawing a short Bug comic to give to him as a gag, but alas, we never did do that. I haven’t seen Willie in a very long time. I think I last saw him sometime in the early ’90s, and I have only the vaguest memory that he had either moved out of the area or he no longer had the disposable income for even his limited comic book habit…or perhaps both. Whatever the reason, Willie and his van became a nearly forgotten memory of my early comics retailing days. …and that memory of Willie and his insistence that a Bug solo comic existed all came back to me. And let me tell you, I had the weirdest combination of bemusement and frustration come over me when I heard about this. I’d actually missed the announcement of this comic, but my longtime customer Brook told me about it and my immediate reaction was an outraged “WHAT! ?” Not outraged at the comic itself, mind you, but outrage at my inability to inform Willie that he would finally be getting what he wanted all those years ago. Ah, Willie. I hope you’re still out there, and somehow, someway, you know this is happening. This post is like. Grant Morrison comic come to life. Please tell me Willie looked just like Kenan Thompson’s SNL character. I sometimes think about a few of the more eclectic subscribers at the comic shop I worked at in the early 90s. One woman only wanted Thunderbirds-related things and always paid me in dimes from a coin purse. Did he somehow get Bug mixed up with Ambush Bug? Only logical explanation I can think of. I assumed he meant the Micronauts character, but that is my bias. What if Willie was from now and had gone back in time and ended up with scrambled memories of his past/future life and this what he was remembering wanting even though it hadn’t been published yet back then?